Well, it seems we’re no nearer finding any documentary evidence for Saxon King Cutha being buried at Catshill or indeed anything for a ‘Battle of Shire Oak’ as posited by those adopting the Brownhills Urban District Council seal, as described in a recent article. Whilst there has been much debate on social media and in the comments here, nothing really has been forthcoming, which to be honest, is much what I expected: Like Piltdown Man or Blake’s Jerusalem, we Britons do like our history to be far more interesting than it usually is. 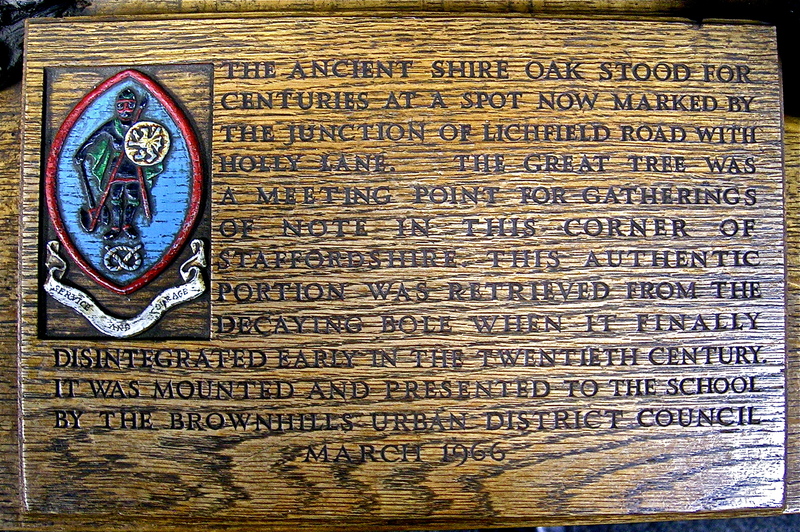 Ian also kindly pointed out a bit of local history in relation to the crest that I completely forgot: There is, in Shire Oak School, a piece of the Shire Oak tree preserved and mounted, The plaque on the mount carries the same crest. I include the post about that, with photos below for completeness. Since this was presented in 1966, and Brownhills Urban District Council formally ceased to exist in April of that year (it merged with Aldridge) I do wonder if the adoption of the crest by the Grammar School was some kind of act of defiance. Thanks to Ian Neil for the help with this post. If you’ve a view on this, do share: BrownhillsBob at Googlemail dot com, comment here or bother me on social media. The Council seal, as depicted in a press cutting supplied by Audrey Proffitt. Following on from my ongoing interest in the Shire Oak (the tree, not the pub) and my request for photos of the preserved piece of the old tree in Shire Oak School, I was contacted by several people with great information – The Edditer of The Bloxidge Tallygraph made a great contribution, as did the ever-resourceful Roger Jones and Julian Ward-Davies. In the next week or so I hope to revisit the subject in a bit more depth. In the meantime, Rome-based ex-Brownhillian Mick P sent these great images to me by email, which were taken on a visit to the school a couple of years ago. It certainly seems to need the love of a good duster. I’m pleased the artifact survives after all this time, but I still wonder what the provenance of it was. 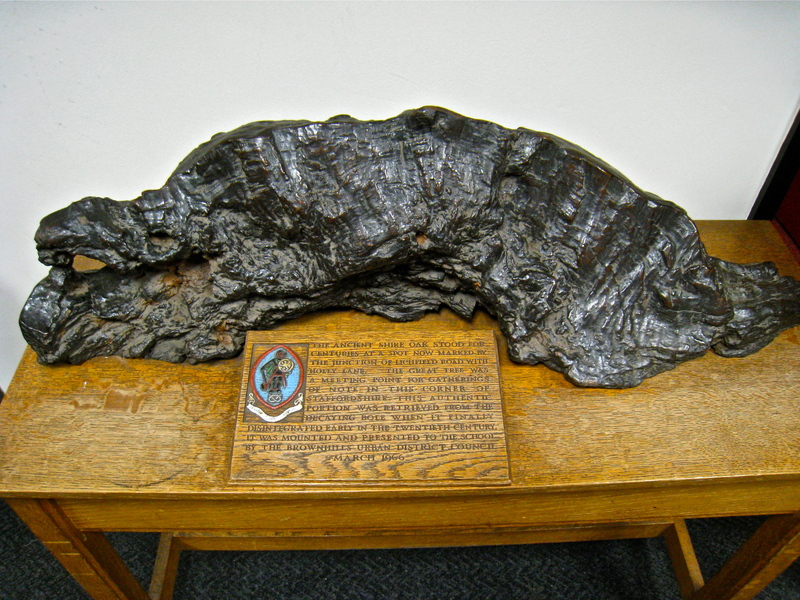 The chunk of (presumably rotting) wood seems to have been stored for at least 50 years before being preserved – or did it sit somewhere else before the UDC donated it? If you have any information, please do comment or mail me: BrownhillsBob at Googlemail dot com. Together, we are assembling a record of our history, bit by bit. I’m so grateful to you all. This entry was posted in Brownhills stuff, Followups, Fun stuff to see and do, Interesting photos, Local History, Local media, Reader enquiries, Shared media, Shared memories, Walsall community, Walsall Wood stuff and tagged Local History, Mick P, Shire Oak, Shire Oak School, Staffordshire, The Shire Oak Tree, Walsall Wood. Bookmark the permalink. 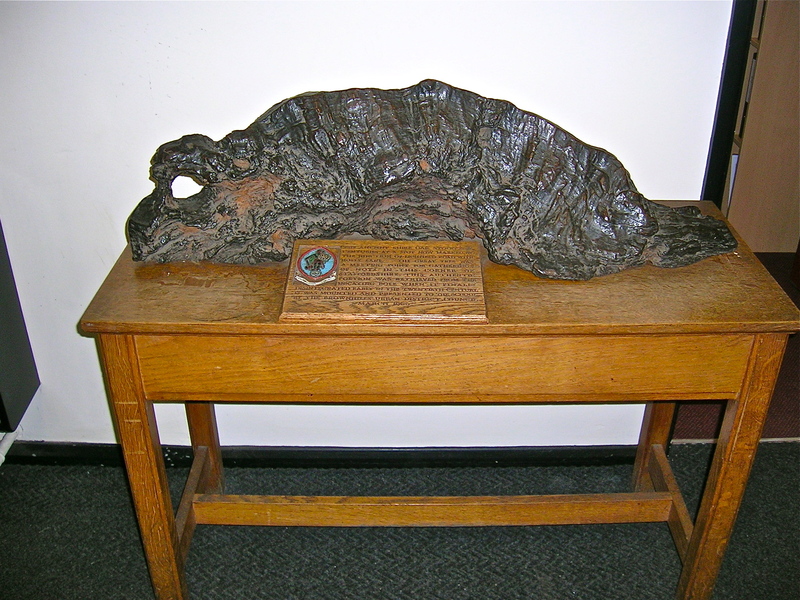 Great to see that chunk of the old Shire Oak is still displayed at the school. It used to be in the school library during my time there (67-74), and I always liked seeing it there.